Coming from the city centre of Vienna and the Ringstraße, you can go down Schwarzenbergplatz towards the Schloss Belvedere Palace - the road you are on is called "Rennweg". Along the Belvedere on the Rennweg side, something like a "Polish Quarter" has developed over the past century. The "spiritual" centre of this community is the Gardekirche, a nice, small, Baroque church directly on Rennweg. You can easily spot it and recognise it as being Polish either by the bronze statue of John Paul II in front of it, or, especially on Sundays, the crowds of Polish worshippers who don′t fit into the church anymore and successfully defend the reputation of Poland for being Europe′s second-most Catholic country after the Vatican. The Gardekirche is not only a nice Baroque church, it is also in a terribly Baroque neighbourhood: The Schloss Belvedere Palace and Gardens are to its opposite and the Palais Schwarzenberg boarders directly to it; a few metres down the Rennweg road, you find the Salesian nunnery′s church, a rather impressive chunk of Baroque with an enormous cupola. The history of the Gardekirche, however, started at a completely different location. In the 16th century, there was a hospital at Ballhausplatz Square, near the Minoritenkirche Church. In 1754, this hospital was transferred to the Rennweg near the Belvedere Palace. Along with the hospital, there was a church that was built at the new site between 1755 and 1763, funded by Empress Maria Theresia - the Gardekirche, but back then, it was still called "Kaiserkapitalkirche zum gekreuzigten Heiland". In the 18th and 19th century, several nations of the Habsburg Empire got their own, national churches - for example, the Minoritenkirche Church near the original site of the hospital is still home to the Italian community of Vienna, ever since the rule of Emperor Joseph II. 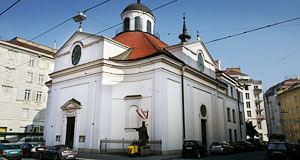 The Gardekirche was given to the Polish of Vienna in 1897, maintained by the Polish order of the Resurrectionists. There are two plates on the front façade of the Gardekirche that commemorate the dedication to the Polish community and praise Emperor Franz Joseph I. The interiors of the Gardekirche are Rococo and are typical examples for the style of the period of Maria Theresia. In the course of WWII, the Gardekirche was slightly damaged - roof and windows suffered from a nearby bomb blast. Attractions nearby are mostly the stated ones: Palais Schwarzenberg, Hochstrahlbrunnen, Belvedere Palace and Parks and the Salesian Church. The Arsenal is not too far, the same thing applies to the attractions of the southern Ringstraße. The neighbourhood around the Gardekirche is fairly nice and good for buying Polish groceries.